Gurney's horticulture specialist Felix shows how to prune a peach tree in it's second year. 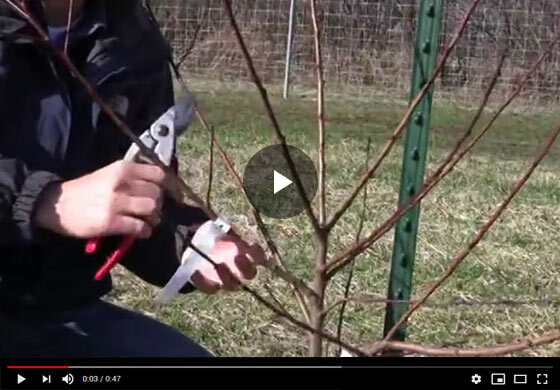 Find out how big a crop to expect and learn pruning tips that will help build your tree up for promising future harvests. Hi everyone, Felix here at Gurney's and we're talking today about how to prune your peach trees. Really this goes for any stone fruit, whether it's a plums or a cherry but we're looking at a peach today and this is a tree we planted last year. We had our what you get in the mail is our single whip, which would have come up to right about here and we got some nice branching and it put on a lot of healthy growth, just performed well for us last year. The consideration that year following planting, so this is the second year, was just to take some of these lower limbs off. This, limb if it develops, is always gonna have fruit hanging down into your soil area or in the way of your mower and so we're gonna take a nice flush cut here and prune that one off coz it's too low. And then we have another one here behind the main trunk, maybe you can't see, that's too low as well. And even this one here is just not, it's just when that has a crop load on it, it's gonna be into, into the ground and that's not doing any good. But all these shoots here, this one here doesn't look as healthy, I'm gonna take that one off, it's just not all that healthy a shoot. So here we have our scaffold. These are, this is your primary branching on your tree, which we called scaffolds. That's gonna be supporting your fruit load later and next year, these three here will probably come off for that third year pruning coz they're also a little low. As tree grows, the height is relative, where those limbs are going to hang down. But these three here are beautiful. They're spaced evenly and there's going to be this nice open center which we'll show you later with some older trees. But this is our real framework, what we wanna encourage. Right, just taking off those couple of limbs, we don't overdo it, and then we are keeping in mind what our open framework is going to be on this fruit tree as it develops. You'll even get a few fruit this year off of this tree. Remember, peaches develop on last year's wood. We have up hereat the top some flower buds on this peach tree. These are those fatter buds that are more developed than some of these vegetative buds below, but we'll get flowering on this tree this year and you can let yourself, let your tree crop a little bit. You don't want it to overdo it, you don't wanna break these nice young branches, so you don't wanna allow three or four big heavy fruit on this little twig here. Maybe one down low will do it and you can enjoy a few peaches this season, but really you're building this for later harvests. So those are your basic pruning techniques on your second year after planting on your peach, plums or a cherry trees. Thanks for joining us.